For 14 hours Tuesday, people in the state voted in a cluster of statewide races like governor, attorney general and treasurer. Full results weren’t available by press time. By 8:30 p.m., half an hour after polls closed, just 3 percent of results were in. Media outlets across the state were reporting long lines in New Haven and Plymouth going into the evening, and there were even large crowds of unregistered voters seeking to register before voting. Go to www.NewBritainHerald.com for full Election Day results. 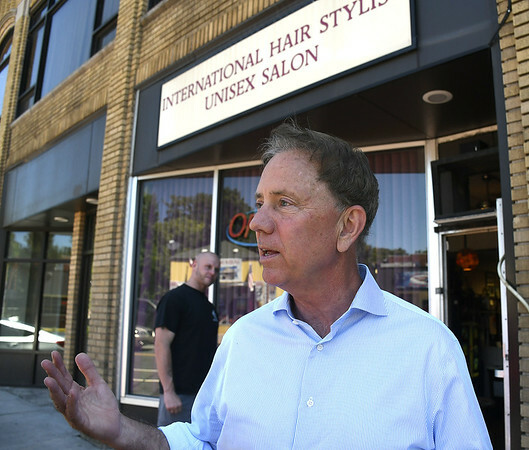 Connecticut’s gubernatorial race pit Democrat Ned Lamont, Republican Bob Stefanowski and unaffiliated candidate Oz Griebel went against each other in the race to run the state. Lamont, a 64-year-old who lives in Greenwich, was running with former Secretary of the State Susan Bysiewicz. The state’s Republican candidate, 56-year-old Bob Stefanowski of Madison, was running with state Sen. Joe Markley, R-Southington. Markley, 61, says he supports public safety and opposes the tax and fee hikes and the imposition of tolls on Connecticut roads. He advocates for cuts in state spending and wants to end the early release program for convicts. In the GOP’s Republican primary for lieutenant governor, Markley defeated Darien First Selectwoman Jayme Stevenson and New Britain Mayor Erin Stewart. Stewart was originally running for governor before changing races ahead of the GOP convention. Oz Griebel, a former Republican, was an unaffiliated candidate in the race running with Democrat Monte Frank on a bipartisan ticket. These were the three major candidates running for governor, but two others have qualified for the ballot. Libertarian Rod Hanscomb and Amigo Constitution Party candidate Mark Stewart Greenstein have both petitioned their way onto November’s ballot. Hanscomb is running with Jeffrey Thibeault and Greenstein is running with John Demitrus. For Secretary of the State, incumbent Denise Merrill was challenged by Republican Susan Chapman, Green Party candidate Mike DeRosa and Libertarian Heather Gwynn. In the Attorney General race, Democrat William Tong faced Republican Susan Hatfield and Green Party candidate Peter Goselin. In the open race for treasurer, Democratic candidate Shawn Wooden was competing with Republican Thad Gray. Libertarian Jesse Brohinsky also ran. Incumbent Democratic Comptroller Kevin Lembo was challenged by Republican Kurt Miller, Green Party candidate Ed Heflin and Libertarian Paul Passarelli. Posted in New Britain Herald, General News on Tuesday, 6 November 2018 20:54. Updated: Tuesday, 6 November 2018 20:56.